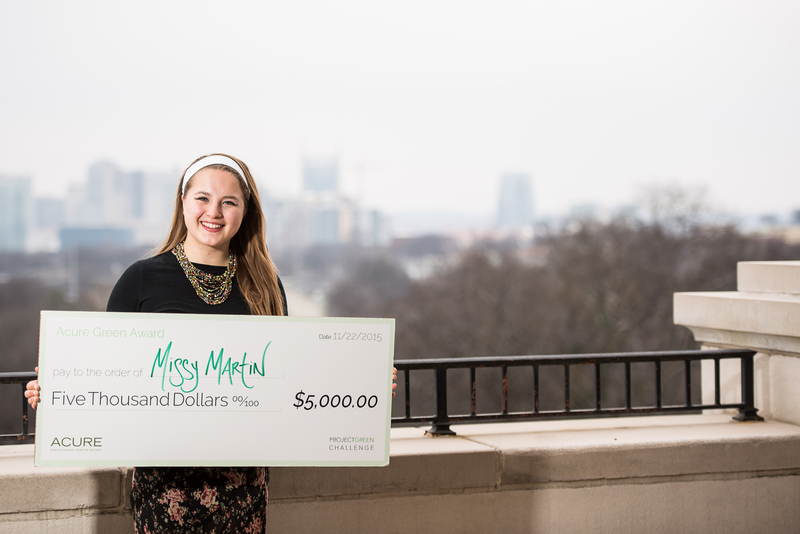 Missy Martin was recently named the Project Green Challenge 2015 Global Champion after claiming first place at the finals, held in San Francisco, California. Martin surpassed thirteen other finalists, selected from thousands of participants, who attended the eco summit and worked together alongside esteemed eco leaders. Among other tasks, finalists interviewed farmers about sustainable practices, cooked FLOSN (fresh local organic seasonal non-GMO) meals, radically decreased water usage, changed personal care and cleaning routines, launched petitions advocating for social change, met with school administration to work toward better practices and planted pollinator gardens. Winners were chosen by a panel of judges. The competition was hosted by nonprofit organization Turning Green, a student-led global movement devoted to education and advocacy around environmentally sustainable and socially responsible choices for individuals, schools and communities. TG seeks to engage youth in the transition from conventional to conscious living, empowering the generation and mobilizing action to sustain a healthy, just and thriving planet. For Martin, the opportunity to get involved with TG and its network has been invaluable. “The guidance and resources Turning Green provided me this month epitomizes the root of relationships, the budding of connections and the blooming of friendships in the global community by providing me the opportunity to engage in discussions and take action with local leaders, school administrators, peers, friends and family,” Martin said. As the champion, Martin received the grand prize package, valued at more than $12,000, which includes a $5,000 Green Award from Acure Organics, a trip to the Natural Products Expo in Anaheim from Aubrey Organics, a $1,000 Whole Foods Market gift card, a trip to the Gaia Herbs farm in North Carolina, a head-to-toe eco makeover complete with clothing, bath and body products and other great prizes.